How to set up Evernote? To integrate FollowUp with Evernote please go to your Settings. 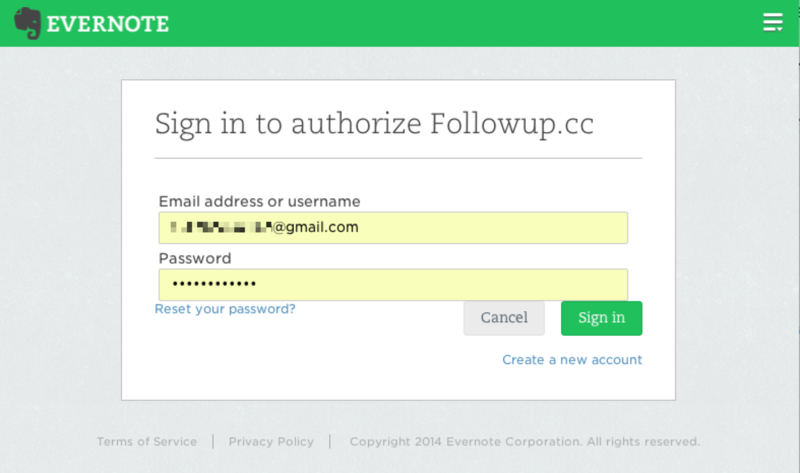 You will be prompted to login and authorize your account with Evernote. Once your account is authorized you can create Evernote notes directly from your inbox. If you have more than one email address in the system to have this feature, you will need to authorize each email account and follow these steps again. How to create reminders in Evernote? Creating reminders is the most powerful feature of Followup’s Evernote Integration. These emails will create a note AND a reminder in Followup. How to create an Evernote via email? All notes created with Followup will be dropped into a notebook called ‘Followup’, and tagged with our ‘followup’ tag. Only notes tagged with the ‘followup’ tag will be tracked; all other notes will be completely private. Once the note is made, you can drag it into whatever folder you like. To stop us from tracking the note, simply delete the ‘followup’ tag and we’ll stop synching our system with the note. How to create follow-ups of your Evernotes? It is very simple. Just add the ‘followup’ tag and set a reminder within Evernote. Q: My reminder is not setting! Make sure your Evernote has the “followup” tag in it. This will happen automatically when you email a note from FollowUp.cc, but if it is removed your reminder will not be detected by FollowUp.cc. If it still in not working, email us in support for help. Q: I set a recurring reminder, but I don’t see it in Evernote. Where did it go? Since Evernote doesn’t have native support for recurring reminders, we can only show you the next occurrence of your reminder. To see more details about your reminder, check your FollowUp.cc calendar or your inbox for the confirmation email we send upon each note creation. Q: I keep getting reminders from both Evernote and Followup. I only want Followup reminders. Q: I put two Followup.cc addresses into the ‘to’ field of my email, but only one note got created. What gives? Followup with Evernote currently only supports one Followup address at the same time. To create multiple reminders you can try recurring reminders, or simply send two emails.